Levels 30-45. Go to Artisan's workshop in Falador. You are going to need a total of 2204 iron ores to get from these levels, and you can bring them noted. Deposit the bars on the smelter. Now withdraw your ores as ingots, and remember to withdraw them in tier 3 form. Use the anvil on the east to make armor. If you make the armor that is displayed at the top of the screen, you will gain an extra 10% bonus exp. Once your inventory is full, deposit your items in the chute the west and repeat the process. Levels 45-60. You will be repeating the same process as the previous step, but this time you are going to want to use steel ingots three. You will need 5400 iron ores and 10200 coal. Levels 60-70. You will again be repeating the same process as step 2, however this time with mithril ingots 3. You are going to need 6894 mithril ore and 31641 coal. Levels 70-88/99. You will once again be doing the same process. To get to level 88, you will need 25, 692 adamant ores and 141, 306 coal. Levels 88-99. Make adamant platebodies. This gives the same experience per hour as Artisian's workshop, however at half the cost, but it is not AFK. This will take 138, 380 adamant bars to make all of these. Complete the Family Crest Quest. This requires level 40 crafting and the ability to defeat a demon using only magic. Once completed, take the gloves you receive to Ava near the Al-Kharid mines, and he will change them into gold-smithing gloves. You must wear these at all times for this method to work. Levels 40-99. Smith gold ores. Gold ores. You will need 231, 267 gold ores to get from 40-99. You can either use the Edgeville furnace, or for an option that gives you more AFK time and magic exp, you can superheat, which takes 43 magic, them all, but this will increase the cost dramatically. You can put Superheat on your hotbar and then spam the buttons to make the time of human error decrease. Getting to 99 smithing will take at least 35M (35, 000, 000gp) if you are buying the ores. In an F2P world the best place to smith is in the Varrock West bank, since the anvil is a few steps away from the bank. You can also make a lot of experience out toward smithing via dungeoneering if done correctly. It can take weeks to smith large amounts of bars and even longer if you are using bad furnaces. Pick a good location. Make what is best money per bar. Look on the Grand Exchange Data Base to find the price for the items and divide that by the number of bars it takes (or multiply it by the number of items it makes, in the case of arrows, knives, cannonballs, etc). That gets the most money back when selling them. In dungeoneering it is recommended to save some tokens to buy a scroll of efficiency. This gives a 10% chance to not use a bar while smithing. It costs 20k tokens as well as 55 dungeoneering and smithing. The Varrock armor allows access to the Edgeville furnace as well as, when worn, gives you the chance to smith double bars when using the furnace. Make sure that you have enough coal for large scale smithing. Running out of coal is time consuming and expensive. 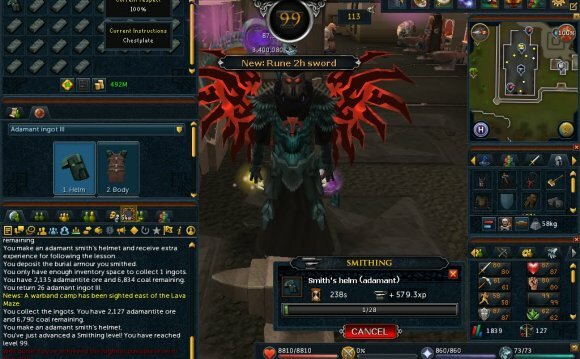 Runescape - 99 Smithing achievement.